You can trust ShelterLogic's selection of shade sail canopies to offer you the greatest durability and versatility at the lowest price. 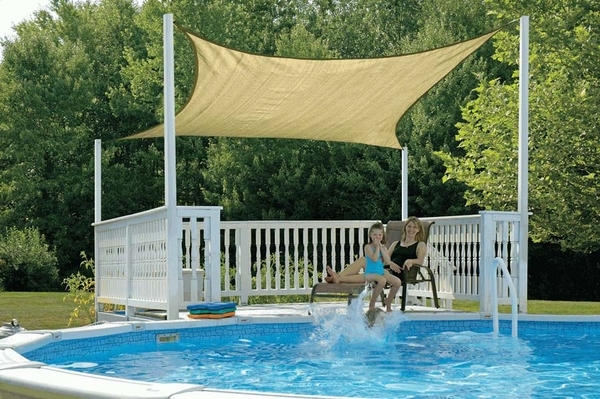 Ruggedly constructed of top-quality polyethylene fabric and tested to withstand fraying and tearing, these shade sail canopies protect against up to 90 percent against UVA and UVB rays at the same time. Assembly and taken down are simple and time-efficient, and all necessary hardware comes included. One year fabric warranty. Do you sale water proof canopies? We like using this out on our deck to protect us from the sun. Since putting it up we can even have our little one out there in his stroller without worrying he?ll get too hot. It came with all the parts we needed. Our only suggestion would be that we thought the nylon braids were kind of ugly, so we used regular rope instead. No complaints?I got this when it was promised to come, and it?s just like the advertisements said it would be. Very pleased.